We hope you all had a wonderful time celebrating the birth of Christ this past week. This weekend Pastor Ryan shared a message about what to do when we have lost our joy, specifically focusing on depression. While this may seem like a different topic to talk about at this time of year, it is a relevant topic. For many of us, the holidays can bring out past hurts, pains, and stress. Through the story of Elijah, we hope you will be encouraged and realize that you are not alone in the struggle. Pastor Ryan walked us through the causes of Elijah’s depression in 1 Kings 19:1-4, then showed us the solutions the Lord provides for Elijah’s depression in 1 Kings 19:5-17. • Physical Exhaustion — Elijah was physically worn out. • Emotional Confusion — Elijah was absorbed with great fear. • Intentional Isolation — Elijah ran into the wilderness alone. • Physical Restoration — Sometimes we neglect our most basic needs (food, sleep, rest). When feeling depressed, a doctor can provide helpful insights. God knows, and wants to provide our needs. • Intentional Community — God desires for us to walk in community and fellowship with other believers. We are not designed to fight this battle alone. God desires for us to seek help. • Can you identify with any of the causes for Elijah’s depression? If so which one and why do you identify with it? • In 1 Kings 19:5-6 God provided Elijah with the most basic of needs. Why do we often neglect our most obvious needs? • Why is it important for us to have intentional community with those around us? Do you feel as though you have good Christian community? What are steps can you take to find community if you don’t have it? This weekend we learned about the Confidence of Christmas as Pastor Ryan led us through a study of Hebrews 1. While this may not be a typical Christmas Scripture passage, it gives us a powerful description of the tiny infant whose birth we will celebrate in just a few days. Fully God and fully man, Jesus is the “radiance of God’s glory and the exact representation of His being” (Hebrews 1:3). 1. Because Jesus is greater than prophets, we don’t have to be confused. 2. Because Jesus is greater than angels, we don’t have to be afraid. 3. Because Jesus is greater than the created order, we don’t have to be pessimistic. • Why is it important that Jesus is greater than the prophets we read about in the Bible? What are some characteristics that set Him apart from prophets? • Read Hebrews 1:14. How does knowing that the angels are working under the orders of Jesus give you confidence? • In what ways have you been counting on creation? How can you begin counting on the Creator in those situations? Read Hebrews 13:8 for some extra encouragement. Today, focus your prayer time on telling Jesus how powerful He is. Thank Him for the ways He has shown His power in your life and pray over the situations in which you need to see His power move. Today our Worship Ministry lead us in a joyful time of music celebrating the Good News of great JOY, Jesus! We were also encouraged by a powerful testimony from Nathan and Lindsey to choose joy in the midst of difficult circumstances. So how do we do that? First we have to understand what JOY is. 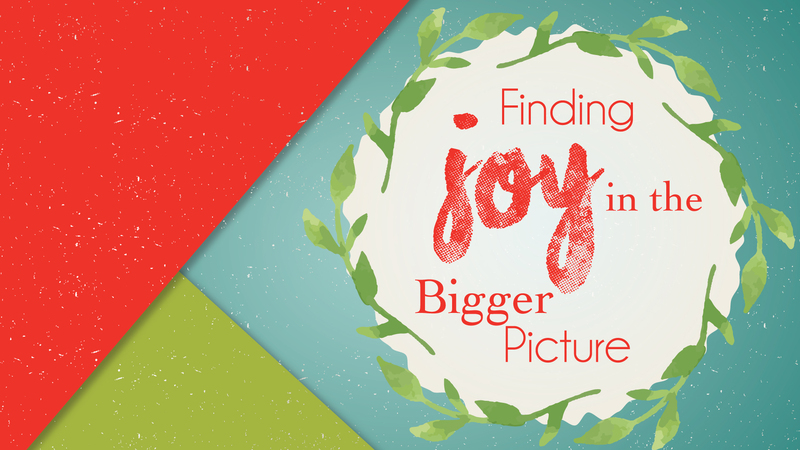 John Piper defines Christian joy as a good feeling in the soul, produced by the Holy Spirit, as He causes us to see the beauty of Christ in the Word and in the world. Real, lasting joy, is brought about by the Holy Spirit showing us how satisfying and glorious the Word of God (Jesus) is to us! Psalm 16:11 says, “in Your presence there is fullness of joy.” We can experience a lasting joy in all circumstances when we focus our attention and affections on the beauty of Jesus. Do you know the old hymn, Turn Your Eyes Upon Jesus? Turn your eyes to worship Jesus with ALL that you are and you will be completely satisfied and filled with lasting joy! • What was your favorite part of the JOY service and why? • How would you define joy? • Do you think it is possible to have joy in all circumstances? • How can you choose joy this week? Today’s passage focused on an attribute that’s not the first one that comes to mind at Christmas. We think of joy, peace, and wonder. However today we discussed humility. Pastor Ryan explained that a solid understanding of true humility this Christmas can transform not only our holiday experience but more importantly, it can be life-changing. This passage shows three special things about humility. 1. Humility is an activity – not just an attitude. The word for humility in v. 3 simply means the sense of valuing yourself appropriately — ”counting others as more significant than ourselves.” We see this beautifully in the Christmas story. The Lord Jesus Christ, in eternity, who was in the form of God, equal with God, didn’t hold on to that position in eternity, but instead was willing to leave all of that and come down here because He knew we were hopeless in our sin. In a moment, the Lord Jesus Christ came down to a manger. 2. You’ll never get humble by focusing on humility. This is what’s so hard about humility, isn’t it? You can think you’re being humble, but you can become prideful about your humility! So how do you get out of that cycle? Christmas shows us how. In v. 7−8, we see that Jesus set aside His rights and took the form of a servant – becoming obedient to the point of death, even death on the cross. The cure for pride is not a focus on being more humble, because you’ll still be focused on yourself! The cure is a focus on others. The lesson of the manger is that the way to humility is take your eyes off yourself completely. 3. Humility is the pathway to our greatest need. Our greatest need is salvation, but we will reject His grace if we’re prideful. We’ll lie to ourselves and think we can be good enough on our own. In that sense, a lack of humility can keep us out of Heaven! The message of Christmas is a message of humility. And the message of humility is the message of salvation. • Have you embraced the gift Christ has offered you by setting aside your own empty boastfulness and recognizing your own needs? • Is there strife among people in your life because you’re holding on to your own rights and agenda? • Are there people in your life that could be blessed by your own willingness to sacrifice? Reflect on how we as Christians celebrate Christmas. Is it any different from how our American culture celebrates Christmas? Allow God to interrupt your plans and to reorient your priorities as we begin this Advent season by remembering the Forgotten Story from John’s gospel. In John 1:1-18 we read the Christmas story from God’s perspective and we find four truths that God reveals to us through Jesus. 1. God sent Jesus from Heaven. 2. God sent Jesus into a dark world. 3. God sent Jesus in the flesh. 4. God sent Jesus with Grace and Truth. How can you celebrate Christmas ‘differently’ this year to reflect the truths found in John 1:1-18? Jesus was not God’s (creator God) highest creation. Jesus was in the beginning with God. All things were made through him. Nothing was made apart from Him. How was ‘God becoming flesh’ a demonstration of His love for you? Pray and thank God for His grace given through Jesus.